The leaves have changed color and are now falling gently to the ground. My children have been waiting for this. They dug out their kid sized rakes and look out the window every morning. "Mummy, can we rake yet?" has been a familiar refrain in our house. Stupid me. Here I thought the kids really were into helping with yard work. Ah, no. We go outside yesterday, with rakes in hand. Sarah runs around, drops her rake on my foot and says, I'm going on the swingset. Let me know when you've gotten a pile of leaves big enough for me to jump in. I think I remember that game. LOL. 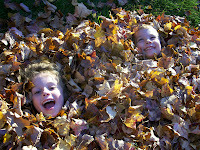 I loved fall and playing in leaves when I was little. My DD hasn't figured it out yet, but being in the high desert we don't really have a good yard and trees for jumping. The sneaky little people strike again!